Did you know that 1 in 5 deaths is the result of a heart attack? According the American Heart Association (AHA), that means that there are almost a half million deaths caused by heart attack each year. There have been reported more than 1.2 million heart attacks per year, from which 40 percent of those people in a given year will likely die from it. One of the best ways to not become one of these heart attack related statistics is to reduce cholesterol. The 2006 Update on Heart Disease and Stroke Statistics put out by the AHA reported that of the people with heart disease almost 50 percent had total blood cholesterol levels above 200 mg/dL, with another 17 percent having total cholesterol over 240 mg/dL. That meant that 67 percent of the people with heart disease could lower their risk by reducing cholesterol levels. Another significant factor contributing to heart disease was physical activity. The same report indicated that only 30 percent of the people with heart disease participated in any kind of regular leisure time physical activity. That may have accounted for the lower readings of High Density Lipoprotein (HDL) cholesterol, which is the good cholesterol. Of those with Coronary Disease, almost 23 percent had HDL levels below 40 mg/dL, which increases the risk of heart disease and can be improved with regular exercise. While there are many factors that can impact the risk of heart disease, reducing cholesterol is one that is quite controllable. Others include regulating blood pressure and controlling diabetes. All of these conditions if left unmanaged cause damage to the arteries and strain the heart increasing your risk of a fatal heart attack. The number one way to reduce cholesterol is to maintain a healthy eating plan and getting regular cardiovascular exercise. In as little as 2 months, a significant reduction in cholesterol can be seen when the right food input and output are put into place. 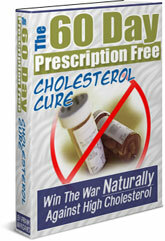 Learn how to reduce cholesterol in The 60-Day Prescription Free Cholesterol Cure. Do you know the Risks Of High Cholesterol? Could Genes be Sabotaging Your Efforts at Lower Cholesterol?